Now that you’re in the middle of your first game, you can see the problem behind any Crap Cube: It’s extremely easy to throw together a random collection of bad cards with little or no synergy, then ship it off to your local game store for eight unsuspecting people (including you) to play-test. To be fair, the cards in this particular Cube aren’t so bad: Whoever designed this had a mind to include some workable removal, evasion, and substance in the mix. However, they still have a long way to go before you can see this collection of cards as anything but a novelty. 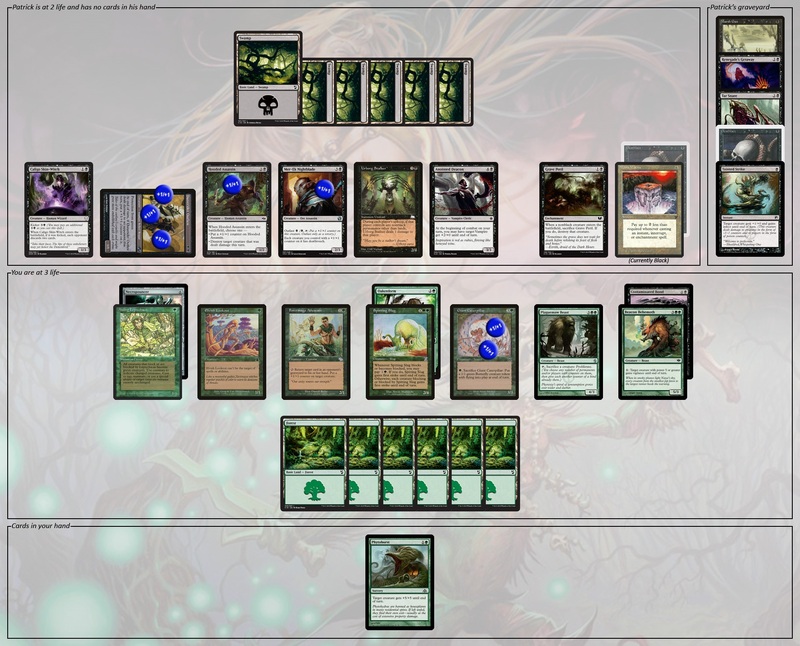 As you’re pondering all this, you’re also seriously regretting placing too much of an emphasis on Green - the result of starting your picks with a Feral Krushok and a Scaled Wurm. Fortunately, your first-round opponent also seems to have gone mono-color... except that Patrick has a Black deck, and it’s far more flexible than yours. On top of that, he seems to have pulled the perfect attacker to deal with your mono-Green abomination. “I’ll attack with my Dunerider Outlaw,” Patrick says, tapping it. “You’re lucky that that has Protection from Green,” you grumble. “Down to four life,” you say, scratching out your new life total on your scorepad while Patrick gives the Outlaw another +1/+1 counter. You can see why Patrick’s playing mono-Black: He’s running an Urborg Stalker and a Grave Peril, and the willingness to stick to a single color has resulted in some benefits. For one, the Black enchantment isn’t letting you play any new creatures (not that you’ve drawn any recently), and it’s preventing you from activating your Giant Caterpillar for a 1/1 flyer. The only nonblack permanent you’ve seen from him so far has been a Mana Matrix... and even then Patrick cast a Deathlace on it a number of turns ago. The sad part, really, is that you were doing so well in the early parts of this game, before Patrick dropped a Mer-Ek Nightblade and built up a small wall of deathtouch blockers. Your opponent is currently down to 2 life, and you haven’t been able to do anything but sit back and wait for him to make a mistake. “I’ll cast an Anointed Deacon,” Patrick says, tapping five Swamps. Idly, you wonder if that means if he has any other Vampires in his deck. You untap your permanents. “I’ll take one more damage from the Stalker,” you say, adjusting your life total once more and glancing at the Contaminated Bond on your Beacon Behemoth. Being at 3 life isn’t a good sign, especially when you know that your opponent can cruise to victory on the back of his Dunerider Outlaw next turn. You peel a card off the top of your library, hoping for some removal (even though you don’t think you have anything that can get past a Protection-from-Green ability). 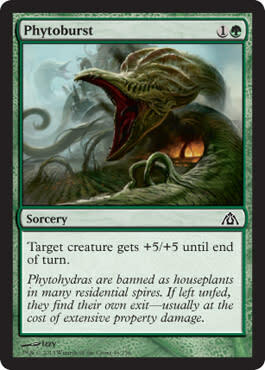 Unfortunately, all you get is a Phytoburst, and you’re not sure how that’s supposed to help. It’s frustrating to have your opponent at a low life total, yet still be unable to do something about it. There’s got to be a way you can break through here... and you somehow have to find it with the sub-optimal cards at your disposal. It is the start of your first main phase. Defeat Patrick before the beginning of his next combat phase. You have not yet played a land this turn. You still have a substantial number of cards remaining in your library, but you know neither the identities nor the order of those cards. If you think you’ve got a great solution in mind, don’t put it in the comments! Instead, send it to puzzles@gatheringmagic.com with the subject line “Puzzle - It’s Not Easy Being Green” by 11:59 P.M. EST on Monday, March 25, 2019. We’ll include the best ones in next week’s article along with the next puzzle! Correct solutions to last week’s puzzle were received from Sean Patrick Keatley, Addison Fox, Russell Jones, Hyman Rosen, CatTribal, Ryou Niji, Michael Feldman, Matt Bocek, and Chris Billard. Partial solutions were also provided by Michael Reluzco, William H., and James Reuterskiold. “Despite half a dozen legendary doppelgaengers on the field,” Matt Bocek writes, “this solution is conceptually straightforward. The exact details of how it plays out, however, sent me running to look up detail on Heroic abilities, the stack, and state-based actions. For simplicity's sake, say we start the turn with 13 mana available, and note how much is left when we spend it. We have plenty of all the colours we need. Destroy Pith Driller with Reckless Reveler (12 mana left). Despondency returns to our hand. Cast Despondency on Artisan of Forms (10 mana left). It's now a 3/5 Feral Abomination. Activate Smelt-Ward Ignus, targeting Artisan of Forms (7 mana left). Gain control of Artisan of Forms. Cast Lava Dart targeting Artisan of Forms (6 mana left). Use the Heroic trigger to copy Polluted Dead. Let the real Polluted Dead die to the legend rule. Destroy Quicksand with its death trigger. Sacrifice a Mountain to Flashback Lava Dart targeting Artisan of Forms. This time, use the trigger to copy Spinal Centipede. The Artisan is now very dead because of both the legend rule and lethal damage. Use the death trigger to put a +1/+1 counter on the real Spinal Centipede. It's now a 4/3. Equip Executioner’s Hood onto Spinal Centipede (4 mana left) and attack with it. Opponent has no artifact or Black creatures to block it. You deal lethal damage. While you can easily build a four-power Black creature with Spinal Centipede, you need to take a detour first and copy Polluted Dead to remove your opponent’s Quicksand. You’ll want to keep the actual Spinal Centipede and not the Artisan of Forms copy, of course, because the Artisan will still have your Despondency attached. It’s also worth noting that the current ‘legend rule’ doesn’t actually force you to sacrifice anything. Having two or more legendary permanents with the same name just causes you to put one of them into the graveyard... but that action still results in a death trigger from the creature involved. Fill up your mana pool by tapping everything and sacrificing the Ebon Stronghold (giving you 9 Black and 4 Red mana). Pay and sacrifice the Reckless Reveler to destroy the Pith Driller, returning Despondency to your hand. Pay to cast Despondency on the Artisan of Forms. Pay for Smelt-Ward Ignus’ ability, targeting the Artisan, which is now yours. Pay to cast Lava Dart on the Artisan, using the Heroic trigger to make it a copy of Cemetery Gate. Despondency falls off and returns to your hand (and the original Cemetery Gate dies). Pay a total of to cast Despondency targeting the Artisan, then counter it with Dash Hopes. Use the Heroic trigger to make it a copy of the Spinal Centipede; the original Spinal Centipede dies, putting a +1/+1 counter on the Artisan - it is now a 4/3 Centipede with 1 damage marked. Sacrifice a tapped Mountain to Flashback Lava Dart on the Artisan. Use the Heroic trigger to make it a Polluted Dead; the original Polluted Dead dies, with its death trigger destroying the Quicksand. Artisan of Forms is now a 4/4 Polluted Dead with 2 damage marked on it. Pay to attach the Executioner’s Hood to the Artisan and swing for 4 lethal unblockable damage.